This book reveals the central role that women played in creating and perpetuating an elite class in the foremost city of colonial British America. Early in the eighteenth century, as the city’s major merchant families sought to reinforce their power over both newcomer immigrants and upwardly mobile middling sorts, they endeavored to remake themselves into a colonial version of the English gentry. Between the 1730s and 1770s, upper-rank women undertook strategies in marriage, consumption, education, and leisure that helped establish themselves and their male kin as the dominant social and cultural figures in Philadelphia and its rural hinterland. In the process, women gained for themselves increased power in courtship, expanded intellectual life, and a developed sense of their own political identity. The Revolution provided the crucial test for the durability of the social and cultural work of these women as they proved ready to defend the privileges of the class they had labored to establish and whose benefits they enjoyed. This study challenges us to recast our conceptions of the relationship between colonial women and genteel culture. 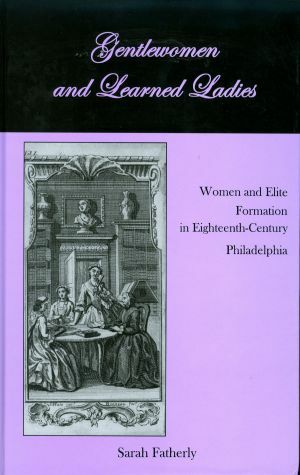 Elite women in Philadelphia were extensively and purposefully involved in the construction of gentility. They helped not only replicate but adapt the English gentry model to the realities of mid-Atlantic life. This meant negotiating the complicated ways in which the values and practices of the Society of Friends at times supported and opposed the formation of a London-modeled elite class. It was ultimately through women’s labor, as much as that of their male counterparts, that their social rank came to enjoy such familiar genteel venues as socially exclusive libraries, dancing assemblies, scientific organizations, water spas, and country estates. By creating and perpetuating genteel culture, elite women reaped great benefits for themselves. Most importantly, the privileges of elite social standing tempered the patriarchal limits that women faced in colonial society. This book highlights how the intersection of gender and class identities powerfully shaped the lives of privileged women in colonial Philadelphia. This account is based on extensive archival research that includes women’s letters and diaries, materials from cultural organizations, British prescriptive literature, Anglican and Quaker religious records, and newspapers. This important study offers fresh insights into colonial America, women’s history, urban history, and the British Atlantic world.